When it comes to choosing your desk, you might think any desk will do. After all, it’s just a place where you store a few papers and sit down to do a little work, right? Wrong. Your desk should be the place where your brain comes alive with thoughts, ideas, creativity and calculations. It should be a place that inspires you to begin working to the very best of your ability the moment you sit down. It should have exactly the right amount of storage space for all your papers, files, notes, tools and everything else you need. Your desk should not be a generic one-size-fits-all solution, because your exact needs are unique to you. How do you find a desk like this? It certainly doesn’t happen by accident. It’s very rare to simply stumble across the perfect desk for you. In almost every case, finding the right desk is a matter of careful searching. It’s a matter of knowing how to choose the right desk, knowing the right criteria to search for and the right questions to ask. Today, we’re going to walk you through this selection process. We’ll talk about important factors to consider when it comes to choosing the right desk, and how to recognize the different types of desks and what they can offer you. By following these steps, we hope that you will be well on your road to finding the desk that is the most perfect for both you and your work. Before you head to the store or begin browsing an online catalog, there are a few things you’ll need to get straight in your head. How Will You Be Primarily Using Your Desk? This is a major consideration when it comes to deciding which desk to choose. Desks are built with many different purposes in mind, and while any desk will provide you with a flat surface to work on, certain desks will be better suited than others to your exact purposes. Will you be working primarily on your computer? If so, will it be a laptop, or do you need a large computer desk with a cubby to put a desktop computer? Do you need enough space for a large monitor or two? Will you need a pullout drawer for a keyboard? Or, will you be primarily writing, filing and performing other tasks where you won’t need a computer? If this is the case, you won’t need quite as much space. Or, finally, is your desk not going to be so much a workspace as it will be a storage space? If this sounds like you, consider the fact that you might not need much surface area at all, and instead you might want to consider a desk with plenty of storage, shelf and drawer space. While a desk’s primary job is to provide a place for you to sit and a tabletop surface for you to work at, its secondary purpose is to provide storage for you. 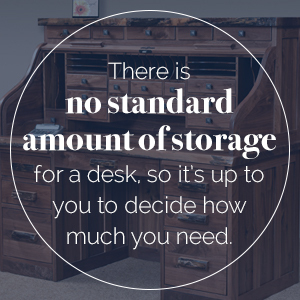 However, there is no standard amount of storage for a desk, and instead, it’s up to you to decide how much you need. Some desks, like writing desks, are more focused on providing surface area for you to work on, while other desks, like large computer desks, offer many more cubbies, shelves and drawers for your storage needs. When you begin shopping for your desk, you’ll need to ask yourself how much storage you need at your desk. Does your work require you to be constantly accessing other materials you’ll need to store at your desk? Do you have boxes and files that you’ll need to store on and in your desk? Or are you much more interested in a simple and clean working surface? Depending on your answers to these questions, you will want to look at vastly different desks. In this way, your answers will help inform your desk-shopping decisions. If you do choose to opt for a desk with more storage, be careful that the amount of storage space doesn’t encroach on the working space. Make sure you select a desk that still provides an ample amount of surface area for you to work on. How Much Time Are You Going to Spend at Your Desk? You might not think your comfort is an extremely important factor when it comes to selecting a desk. But don’t be so sure. If you plan on spending long hours seated at a desk, you absolutely want to choose a model and style where you will be comfortable. There’s nothing worse than trying to work when your neck and back are cramping, and you don’t have enough room for your knees under the desk. Keep in mind, choosing the right desk chair is just as important in this regard. Think about what makes you comfortable at a desk, then look for a desk that has these features. Do you enjoy having a place to rest your feet under your desk? Do you have very long legs that sometimes have trouble fitting under desks? These are all factors to take into consideration. As tempting as it might be to dismiss these as insignificant concerns, remember they will become much bigger concerns after you’ve been sitting at your desk and trying to work for hours on end. If you’re trying to figure out if a desk is the right size for you or not, test yourself against these standards. When you’re seated, your arms should rest on the top of the desk and be bent at a 90-degree angle. Your legs should have plenty of room underneath the desk. Most desks — although not all — are a standard 30 inches high. This height is good for most people, but if you’re significantly taller or shorter than average, you may need to look into more custom options. There isn’t any way to get around this realistic question. You have a limited space to fit a desk into. Certainly, you can rearrange your furniture to try to make a little more room. The reality is, however, that you are limited by the space in the room where you will place the desk. Even if you want and need an extremely large desk, there may not always be room for it. 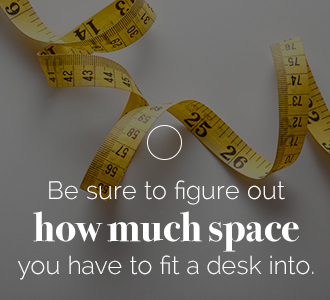 Before you begin shopping, you’ll need to figure out how much space you have to fit a desk into. Grab a tape measure or a yardstick and measure out the actual dimensions. With these numbers ready and waiting, you’ll be able to dismiss many of your options right away, giving you a much more manageable selection to choose from. What Shape Desk Do You Want? Desks come in all shapes and sizes today. There are standard rectangular desks, but there’s also much more than that. There are corner desks, U-shaped desks and L-shaped desks. All of these provide slightly different perks that make them uniquely suited to different types of applications and uses. To decide which shape works best for you, we recommend considering both the size and shape of the space you have to fill, as well as your purposes in using it. For example, a corner desk is great if you have an available corner to fill, but keep in mind most likely have no choice but to end up facing a wall. Here are examples of different desk shapes and some considerations when it comes to choosing the right one for your space. Armoire: These desks are ideal for bedrooms and other multi-purpose spaces, since you can close them when you’re finished working. However, they don’t offer much work area. U-shaped: This style gives you lots of room to spread out and create different work zones, but it requires a lot of available room space. L-shaped: These desks have the same benefits as the U-shaped desks, but require less space. However, their unique shape means there is often only one possible placement in any given room. Corner: Corner desks are great for saving space and fitting into corners that would otherwise be dead space, but this means you’re forced to sit facing a wall. Straight: These desks are by far the most versatile in terms of possible placement, but they can be lacking in surface area. Next, there is the question of what type of material you would like your desk to be made from. This question might not be the first that comes to your mind when you think about desk shopping, but it’s certainly an important one. Each different type of material brings a different assortment of pros and cons you’ll need to sort out as you decide which is right for you and your needs. Here are the most common types of desk materials and a few considerations with each. Laminate: Laminate is often a very popular choice because of its extremely affordable nature. Desks made from this material are often quite durable and very lightweight, making them easy to move. Be wary of any laminate desks that are overly cheap and flimsy, however. Metal: Metal desks are usually more durable than laminate. They’re more likely to last longer and usually weigh slightly more, as well. Wood: Wood is arguably the most classic choice, as many people love the timeless look of a polished wood surface. Be aware, however, that this surface is also susceptible to nicks and water stains. If you want to know how to choose the perfect desk for you, it will be helpful to first know what types of desks are available. With that goal in mind, let’s take a look at some of the most common and popular desk styles. We’ll give a brief overview of what they are, as well as some of their pros and cons. Keep in mind there will always be outlying desks that don’t fit neatly into these categories. However, this guide covers the most common desks you’ll encounter in your shopping. Writing desks might be the simplest desks you’ll find. As you can expect from the name, they’re designed with primarily writing in mind. Because of this, they aren’t intended to accommodate bulky computers or excessive amounts of storage. They tend to be plain, small and to be used as a simple flat surface to write on, whether that be writing on paper or on a laptop computer. These desks tend to be small. They are easy to fit into more crowded spaces like bedrooms, living rooms and home offices, without being too obtrusive or dominating the room. The positioning options for these desks are almost endless. Because they’re so small, you can put them against a wall, in the middle of the room or anywhere in between. Their generic rectangular shape makes them ideal for almost any position. They’re often less expensive than bigger desks with more storage space and surface area. Writing desks don’t usually have much storage. While you may find a desk with a bit more, it’s common for these desks to only have one long drawer or no drawer at all. This arrangement is perfect if you’re only looking for a flat writing surface, but it’s unlikely to work if you’re looking for more storage space. These small desks won’t work if you’re looking to set up a large desktop computer and monitor setup. Even if you do manage to get them to fit, you will likely have room for nothing else on your desk. There is a large amount of variety among computer desks, and there isn’t really one standard model all these desks take after. Instead, as you shop around, you’ll notice a huge range of different designs and styles. Typically, these desks are large and fairly bulky. They commonly include a pullout drawer for a keyboard, a cupboard or cubby for a CPU, plenty of space for a monitor and lots and lots of storage space. There will also typically be space to organize wires in the back of the desk, since you’ll be dealing with all the cords and cables from your computer, monitor, keyboard and other electronic accessories. If you’re looking to store and use a large desktop computer, this type of desk is the way to go. It’ll give you all the space you need for the computer and all the related equipment, with space left over for paperwork and other tasks. While not every computer desk offers lots of storage, this is a common feature with this kind of desk. Many computer desks provide storage space in the form or a built-in hutch that sits on top of the desk, in addition to drawers and cubbies down below. Because of their large size, computer desks tend to be highly bulky. They’re difficult to fit into many rooms, and even when they do, they tend to dominate the entire space. These desks are usually very large, making them hard to move. Usually, you’ll need to recruit a team of two or three people to shift one of these into position. With the large size of computer desks, you will often be limited in terms of available positions for furniture arrangement. Most likely, you will need to position it against a wall somewhere. This isn’t inherently a drawback, but it can be a negative if you’d prefer to face the center of a room. Executive desks make a statement. They are often the centerpiece of an office or a traditional study. They’re typically large, bulky and are designed to impress. Unlike the computer desk, they don’t often have the overhead hutch, but they still have plenty of storage space in the form of many drawers. They also usually have plenty of surface area for your paperwork or computer needs. It’s impossible to talk about the pros of the executive desk without mentioning aesthetics. These desks look amazing, and they carry a feeling of style, sophistication and importance with them that makes every room they’re in feel much more significant. Executive desks usually have an extremely impressive amount of storage space in the form of drawers. This means plenty of space to store papers, files, boxes, desk supplies, knickknacks and anything else you might ever want to have on hand when you’re working at your desk. There is a bit of variety in shape when it comes to executive desks. They might be a rectangle, a U-shape, a corner desk or just about anything else. You have plenty of options and can choose the desk that fits best with your room setup. These desks are usually very large, making them bulky and hard to move. Once you’ve gotten your desk into place, moving it again is going to be hard unless you have a team of people willing to help you. Because these desks are so large, have so much storage and are so imposing, they often tend to fall on the more expensive side of the desk spectrum. While they’re well worth every penny for the amount of space and storage, they will nonetheless usually be more expensive than a simple writing desk. As with every category of desk, there’s a bit of variety in this subset of desks. Secretary desks include things like rolltop desks, bureau and armoire desks and others. Typically, a secretary desk is a straight, upright model that has a small back hutch of some variety with storage space. Quite often, the front of the desk will close up, covering the top surface area as well as any storage space. These desks tend to be small and lightweight, making them easy to move and easy to slide into small spaces. Because many secretary desks can close up and hide any traces of your work, they fit well into bedrooms and shared living spaces where you might not want your work plainly visible, or where a larger desk would dominate the entire room. Because these desks are typically designed in such a way that you can place them against a wall, your placement options are slightly limited. While it would be possible to position one of these desks in the middle of the room, it would look quite odd. Most secretary desks offer a limited amount of surface space to work with. That means large desktop computers are largely not an option. Even if you need a lot of space to complete paperwork, you may find yourself cramped at a secretary desk. If you’ve decided you’re in the market for a durable and classic hardwood desk, there’s no better place to shop than at AmishOutletStore.com. All our desks are custom-made by skilled and experienced Amish artisans and woodworkers, and they’re built of high-quality pieces of wood that will last for generations in your home. Our finished pieces don’t just provide the function you need. They’re also true works of art that will add beauty, style and practicality to any room they’re in. Browse our full selection of solid wood desk furniture today, and be sure to contact us if you have any questions about our furniture and how it can be the right fit for your home.